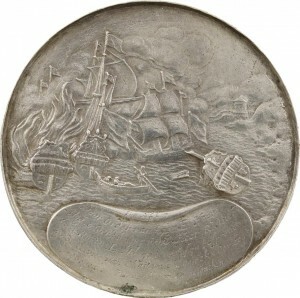 The ships burnt in the Medway and the Proclamation of Peace, silver medal, 1667, by Pieter van Abeele, the burning ships near Chatham, to right a vessel sinks, inscription on a ‘shell’ below. “Jun . 1667 Door Order van haer E. Hoogh Mog onder ‘t’beleyt van d . Heer . 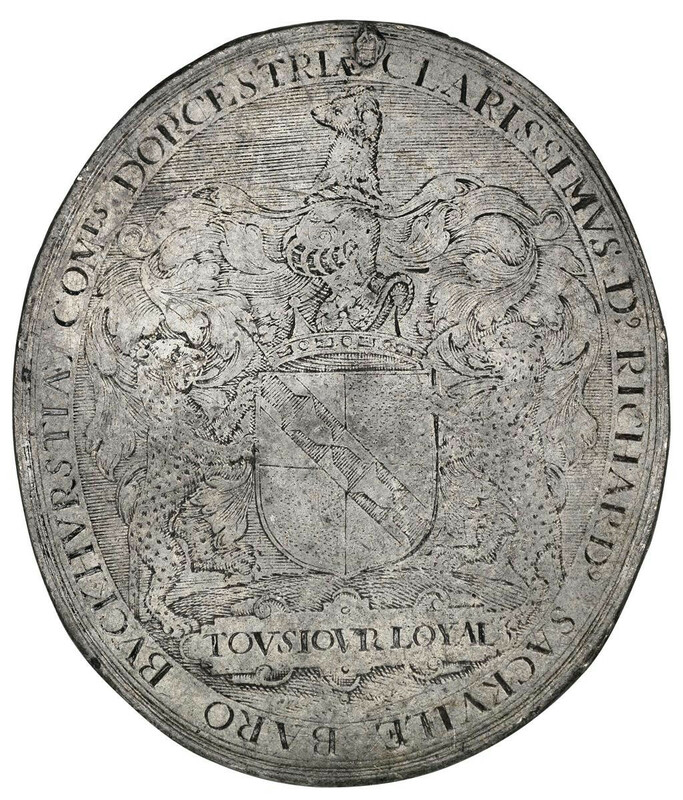 R . Mich . A . d . Ruyter L . Ad . generael syn besprongen op de Rivier van Chattam d Coninckx Oorloogh Schepen en die verbrant en gesonken”, rev., Peace seated on trophies, infant genii to either side and stands of shields, “Den 6 Serptembr Ano 1667 is de Vreede …van Groot-Britanien gepublifeert” , 72.5mm (MI 533/182; vL II, 559; MH 584; Pax 266). Very fine and extremely rare. 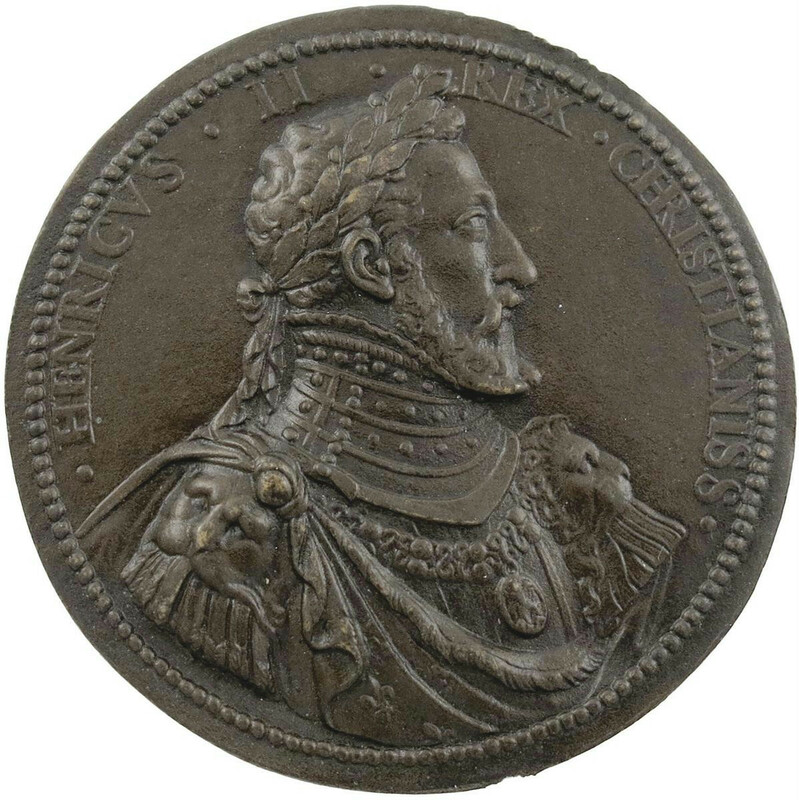 This entry was posted in English, Foley Collection, Medals on November 24, 2015 by anelson. 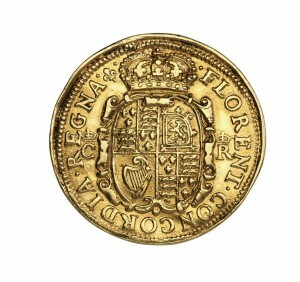 King Charles I, Gold Unite, by Abraham Van der Doort Very fine and very rare. 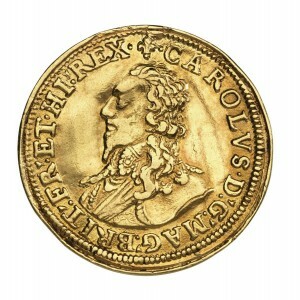 Charles I, pattern gold Unite, by Abraham Vanderdoort [van der Doort], mm. 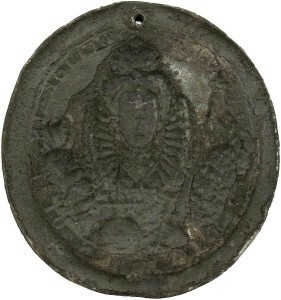 lis, armoured bust left, long hair falling over lace collar, wearing ribbon of the Garter George, rev., crowned royal arms in garnished oval shield, between crowned C – R, FLORENT CONCORDIA REGNA, 7.49g, 30mm (MI 374/269; Allen vi; Brooker 1239; North 2655; Wilson & Rasmussen 22; cf. 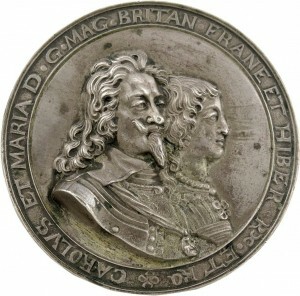 Farquhar I, 178; Platt – ). Very fine and very rare. Provenance: J.G. Brooker Collection. Ex. “Clarendon” Collection, pt. II, Captain Vivian Hewitt Collection. 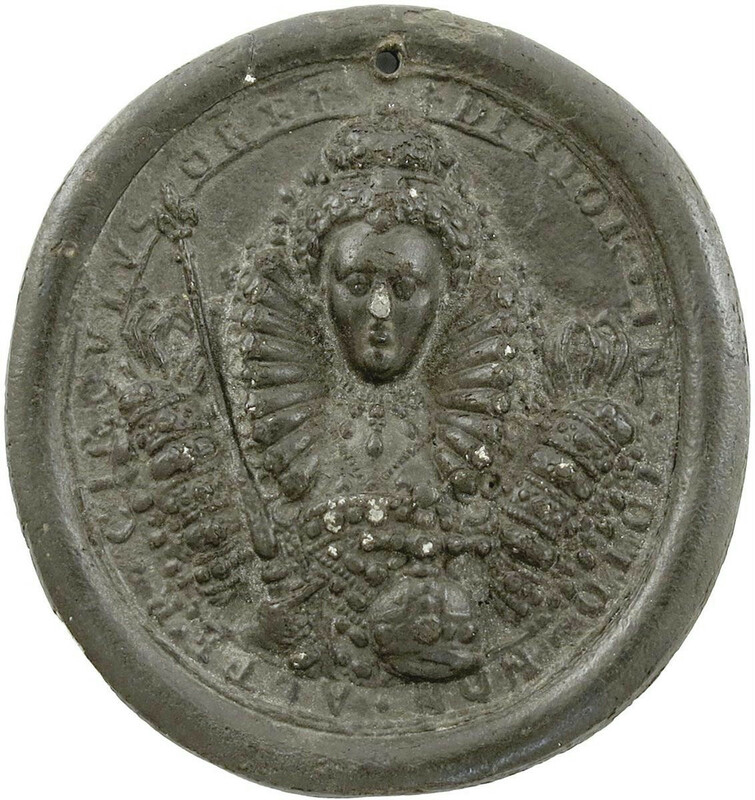 This entry was posted in Foley Collection, Medals and tagged Early Medal on November 24, 2015 by anelson. 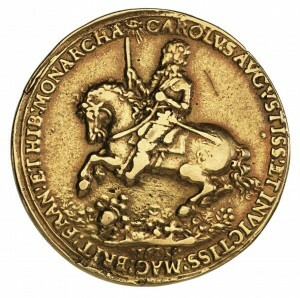 Charles I, the return to London, cast gold medal, 1633, by Nicolas Briot, king on horseback left, holding sceptre in right hand, Eye of Providence above, plumed helmet on flowery ground below, CAROLVA AVGVSTISS ET INVICTISS MAG BRIT FRAN ET HIB MONARCHA – 1633, rev., a panoramic view of the city of London, with St Paul’s and old London Bridge, SOL ORBEM RADIANS SIC REX ILLVMINAT URBEM, view of the city of London, sun above, a small E to the left of the sun, 42.5mm (MI 266/62; Eim.124; CP.20/4; BMC [Jones] 158a; Platt p. 135, type B, this specimen illustrated). 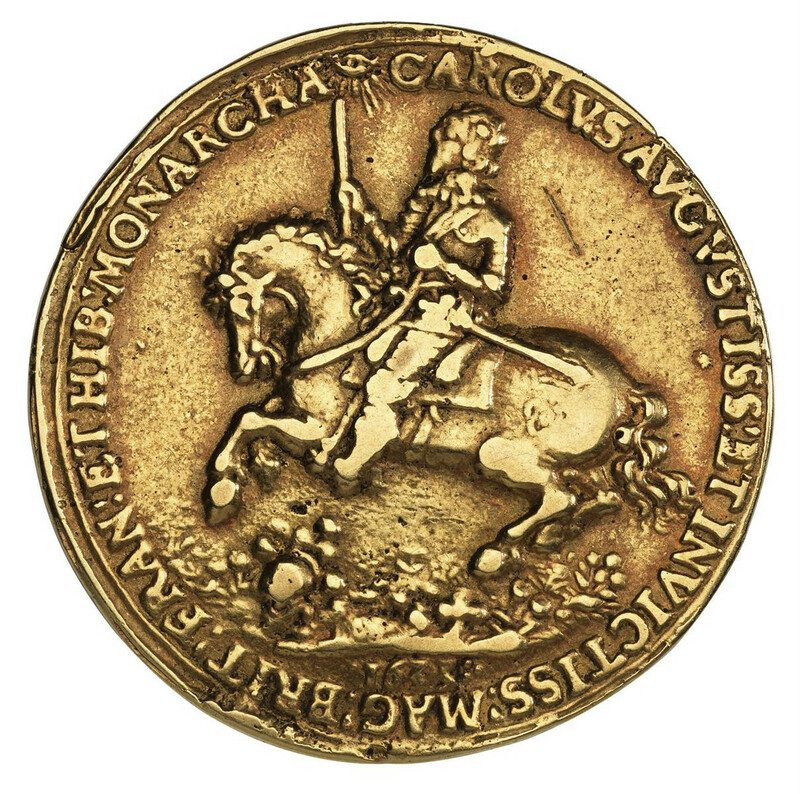 Whilst the medal commemorates the king’s return to London following his Coronation in Scotland, Charles did not enter the city directly due to an outbreak of the plague. This entry was posted in English, Foley Collection, Medals and tagged Briot, Early Medal on November 24, 2015 by anelson. 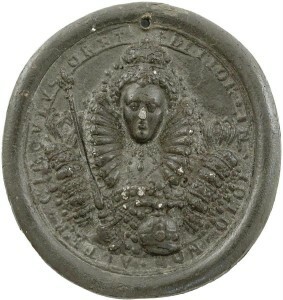 Elizabeth I, the Dangers Averted, uniface lead or pewter cast impression of the obverse, 1589, by Nicholas Hilliard (c.1547-1619), facing crowned bust in elaborate dress and high ruff collar, holding sceptre and orb, DITIOR IN TOTO NON ALTER CIRCVLVS ORBE, wide raised border, 66 x 62.5mm, believed to be 18th Century (MI 154/130; cf Eim. 62; MH 19; Scher  164;). Small piercing at top, cast with hollowed reverse, very fine. 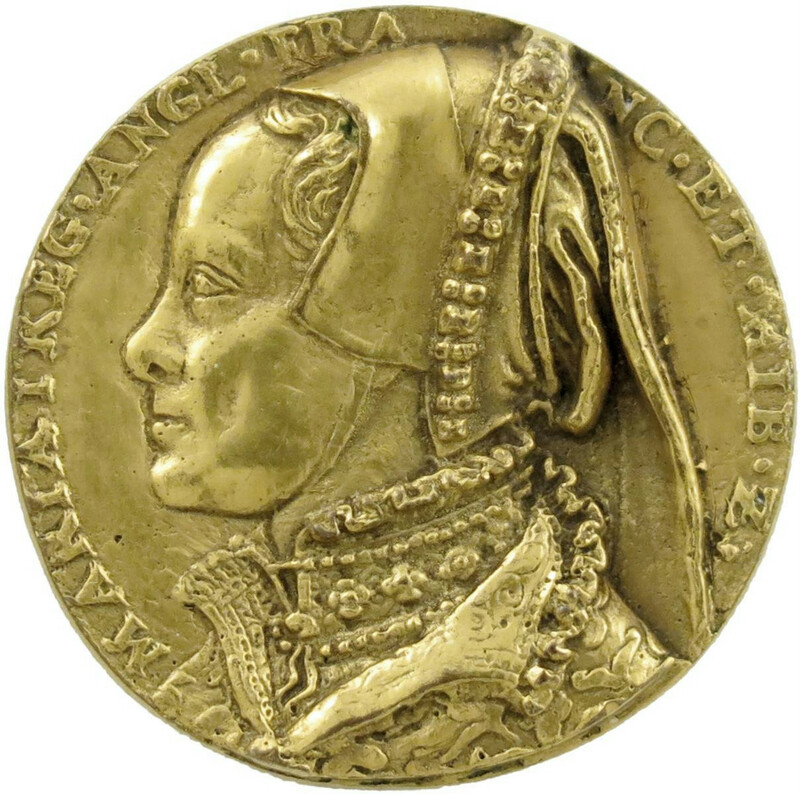 This entry was posted in English, Medals on November 24, 2015 by anelson. 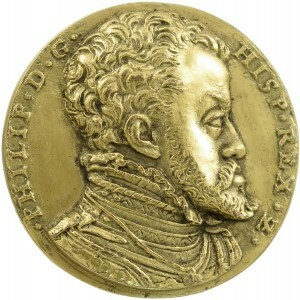 Philip II of Spain and Queen Mary, cast and richly gilt-bronze medal, c. 1555, by Jacques Jonghelinck, after Jacopo Nizolla da Trezzo, bust of Mary left in embroidered gown, wearing jewelled cap and with veil falling down back (after the portrait by Antonis Mors), MARIA I REG ANGL FRANC ET HIB Z, rev., bust of Philip right in high collar, wearing order of the Golden Fleece, PHILIP DG HISP REX Z, 35.5mm (MI 72/18; Smolderen p. 421, F8; Arm. I, 242, 5; Att p. 89, fig. 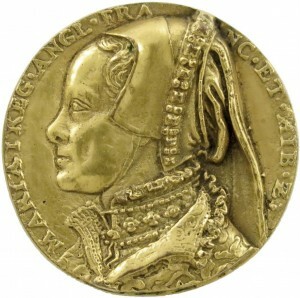 26 for the example in gold in the BM). 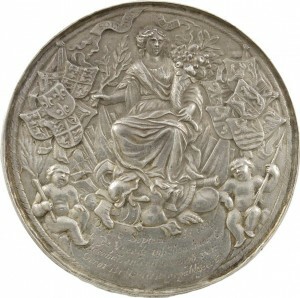 A superb and contemporary cast, in high relief and lightly chased, about extremely fine. This entry was posted in Medals on November 24, 2015 by anelson. 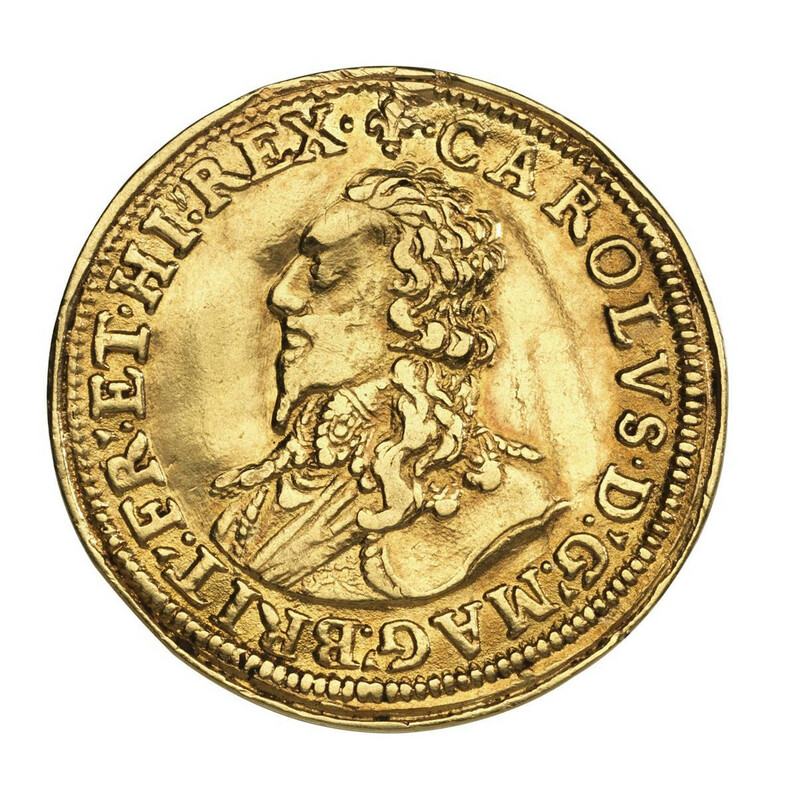 Philip II of Spain, Kingdom of the Two Sicilies, gold Scudo [Scudo d’oro], undated, by Giovan Battista Ravaschieri, bare head right, monogram behind, legend with English title, PHILIP R ANG FRA NEAP P HIS, rev., crowned and garnished oval shield of arms, HISPANI PRINCEP, 23mm; 3.35g (MI 69/14; Fr. 836a; P & R 1). 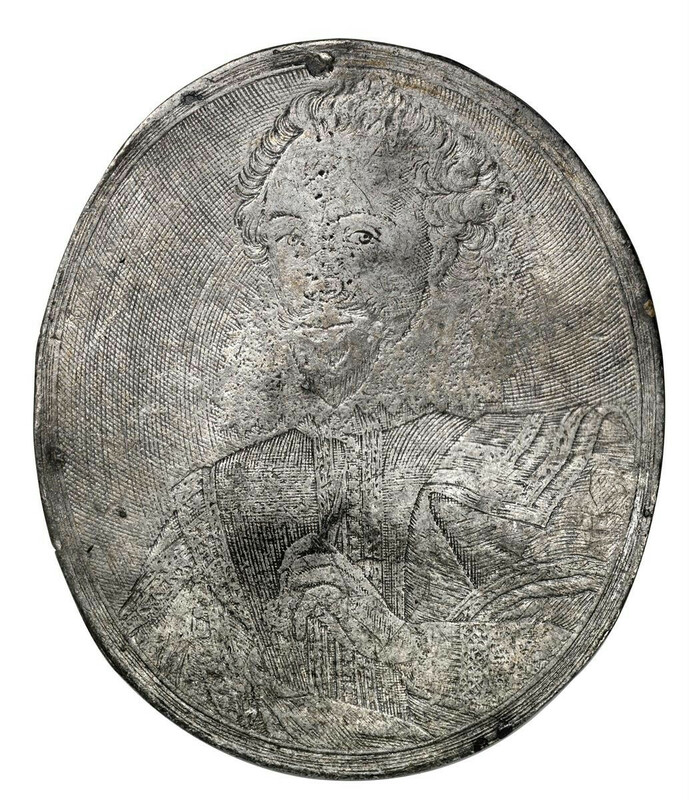 A most pleasing example, much as struck, with an excellent portrait, nearly extremely fine and very rare. 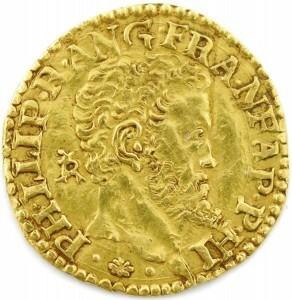 Giovan Battista Ravaschieri, Mint-director at Naples (1525-1560). 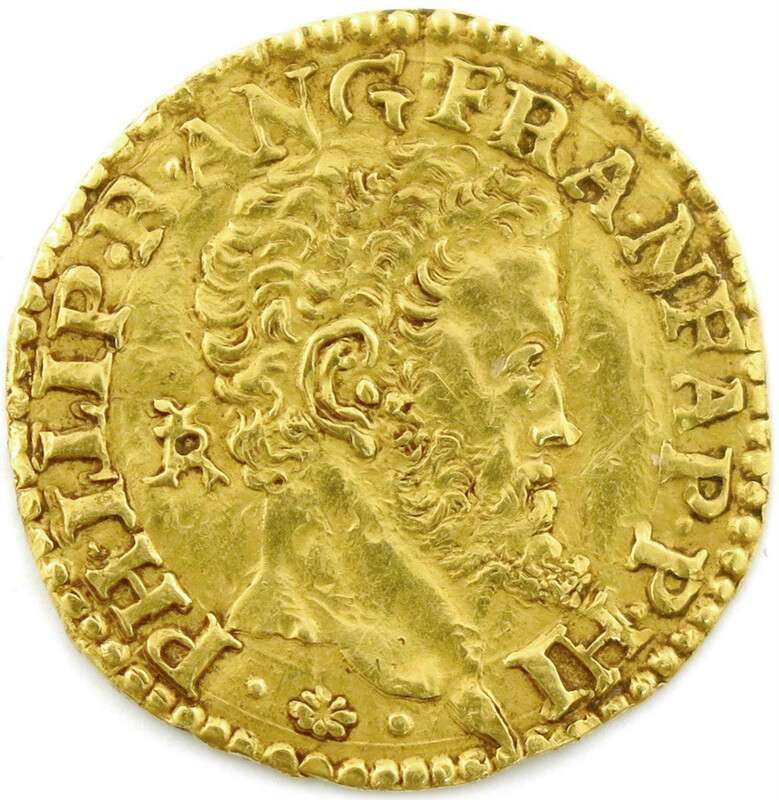 MI lists six coins of Philip II on account of his English title and because some earlier references have them listed as medals. 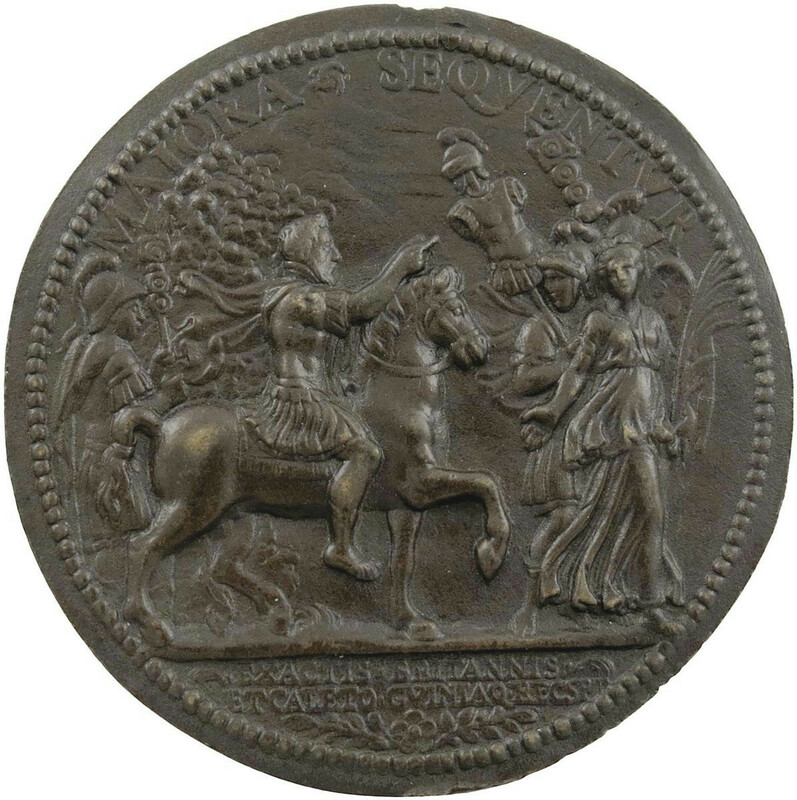 This entry was posted in Foley Collection, Italian, Medals on October 11, 2015 by anelson. Charles I, Death and Memorial, cast silver medal, 1649, by Thomas Rawlins, bust left, his hair long and holding a crown of thorns to his chest, CHRISTI TRACTO, legend around in two lines, IANII 30 1648 CAROLVS PRIMVS MORITVR ET VIVIT EST NOBILE VICENDI GENVS PATIENTIA, floral border, rev., in imitation of engraving, a rock buffeted by the winds and waves, IMMOTA TRIVMPHANS, corded border, 26. 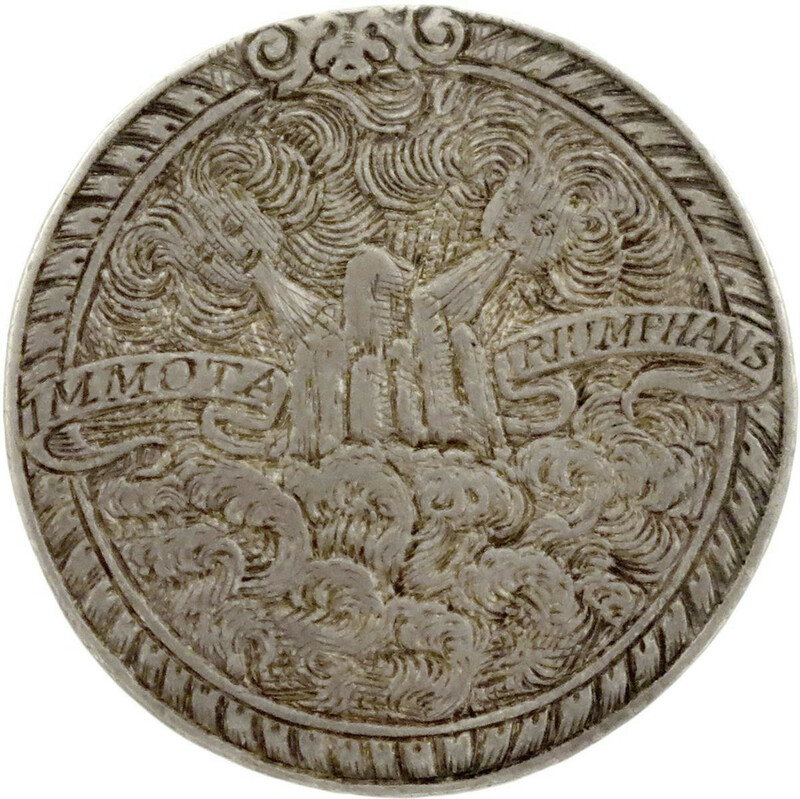 5mm (MI 342/191; Platt I, type E, pp. 247- 248; Farquhar p. 270; Farquhar p. 269). 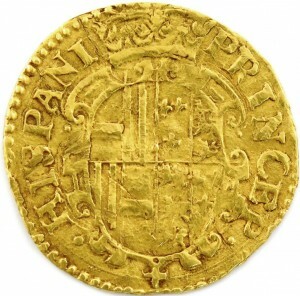 Nearly extremely fine, obverse deeply toned, extremely rare. This entry was posted in English, Medals on October 11, 2015 by anelson. Henri II (1519-1547-1559), King of France, the surrender of Calais, cast bronze medal, 1558, laureate and armoured bust of Henri right, the armour with lion-head shoulder plates, wearing the badge of St Michael, HENRICVS II REX CHRISTIANISS, rev., Henri on horseback attended by soldiers and preceded by Victory and Peace, MAIORA SEQVENTVR, in exergue, EXACTIS BRITANNIS ET CALETO GVINIAQ RECEPT, beaded border to both sides and on thin flan, 75mm (MI 88/57; BMC [Jones] – ; van Mieris III, 422; Trésor I, XI, 6). A high quality early cast with dark brown patina. Calais surrendered to the French on 10 January, 1558. 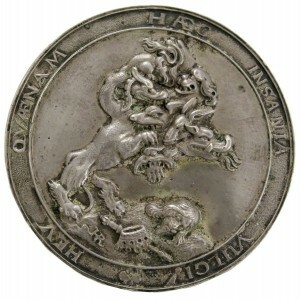 This entry was posted in Fench, Foley Collection, Italian, Medals on May 28, 2015 by anelson. 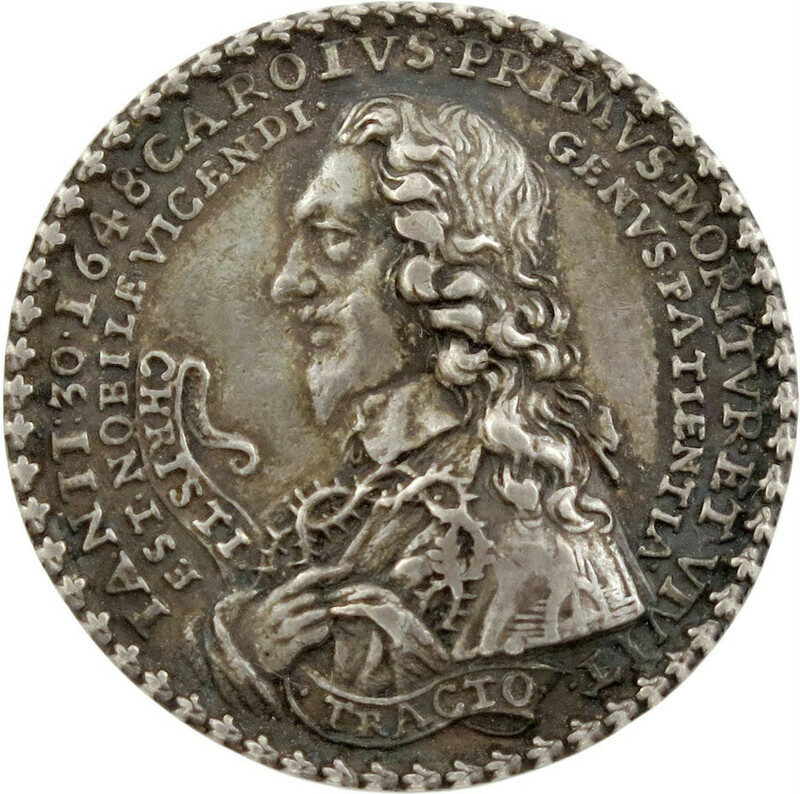 Richard Sackville, 3rd Earl of Dorset, (1590-1624), oval tin portrait medal, undated, in imitation engraving, by Simon de Passe, bust of Sackville three-quarters left (turning to viewer), wearing lace collar and doublet, the string of which he holds in his left hand, rev., Sackville arms with leopard supporters and crested helm, below in cartouche, TOVSIOVR LOYAL, legend around, CLARISSIMVS D RICHARD SACKVILE BARO BVCKHVRSTIÆ COMES DORCESTRIÆ, 53 x 46.5mm (MI 232/93). 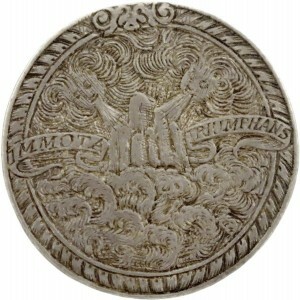 Strictly fine and unusual as a soft-metal cast, pierced and plugged at top, excessively rare. 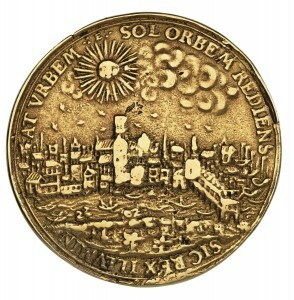 MI has placed this medal as 1624 but it was almost certainly made somewhat earlier. 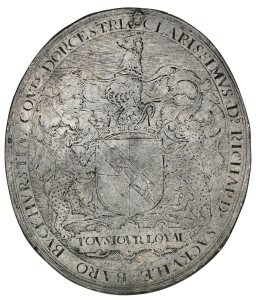 1624 was both the year of Sackville’s death and the year that de Passe moved to Denmark. The silver specimen in the BM is listed in MI as “Unique?”. This is the only other specimen in the Falkiner Index. This entry was posted in English, Foley Collection, Medals on May 28, 2015 by anelson.